Acute health care environments can be stressful settings with clinicians experiencing deleterious effects of burnout and compassion fatigue affecting their mental health. Subsequently, the quality of patient care and outcomes may be threatened if clinicians experience burnout or compassion fatigue. 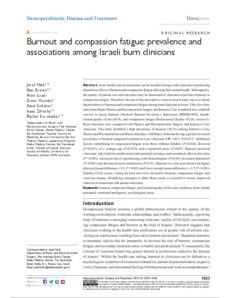 Therefore, the aim of this descriptive, cross-sectional study was to evaluate the prevalence of burnout and compassion fatigue among burn clinicians in Israel. Fifty-five clinicians from Burns, Plastics and Reconstruction Surgery and Intensive Care completed four validated surveys to assess burnout (Maslach Burnout Inventory), depression (PRIME-MD), healthrelated quality of life (SF-8), and compassion fatigue (Professional Quality of Life version 5). Burn clinicians were compared with Plastics and Reconstruction Surgery and Intensive Care clinicians. This study identified a high prevalence of burnout (38.2%) among Intensive Care, Plastics and Reconstruction and Burns clinicians, with Burns clinicians having a greatly increased prevalence of burnout compared to Intensive Care clinicians (OR = 24.3, P = 0.017). Additional factors contributing to compassion fatigue were those without children (P = 0.016), divorced (P = 0.035), of a younger age (P = 0.019), and a registered nurse (P = 0.05). Burnout increased clinicians’ risk of adverse professional and personal outcomes and correlated with less free time (P, 0.001), increased risk of experiencing work-home disputes (P = 0.05), increased depression (P = 0.001) and decreased career satisfaction (P = 0.01). Burnout was also associated with higher physical (mean difference = 3.8, P, 0.001) and lower mental (mean difference = −3.5, P, 0.001) Quality of Life scores. Caring for burn survivors can lead to burnout, compassion fatigue, and vicarious trauma. Identifying strategies to abate these issues is essential to ensure improved clinicial environments and patient outcomes.